They both achieved internet stardom overnight, and now they've teamed up together for a photo shoot. 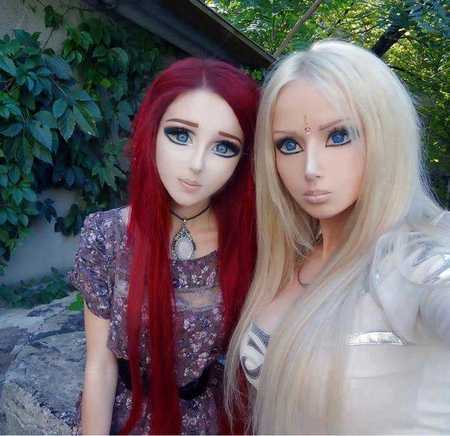 The ‘real-life Russian Barbie doll' Valeria Lukyanova and 19 year-old Anastasiya Shpagina who will be known to many as the ‘Anime Girl' recently got together for a photo shoot in Japan. He PingPing, the world's shortest man, died in 2011 at the age of 21. 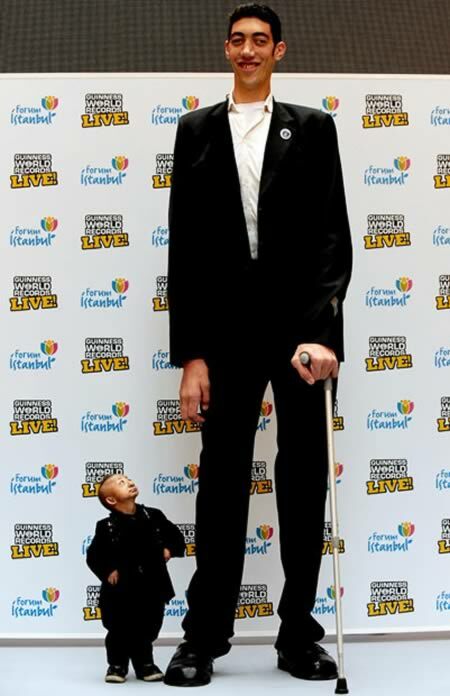 Here, we look back at when he met the world's tallest man. Sultan Kosen, 8 ft 1 in (246.5 cm), welcomes the shortest man in the world, 2 ft 5.37 in (74.61 cm) He Pingping, to his native Turkey. 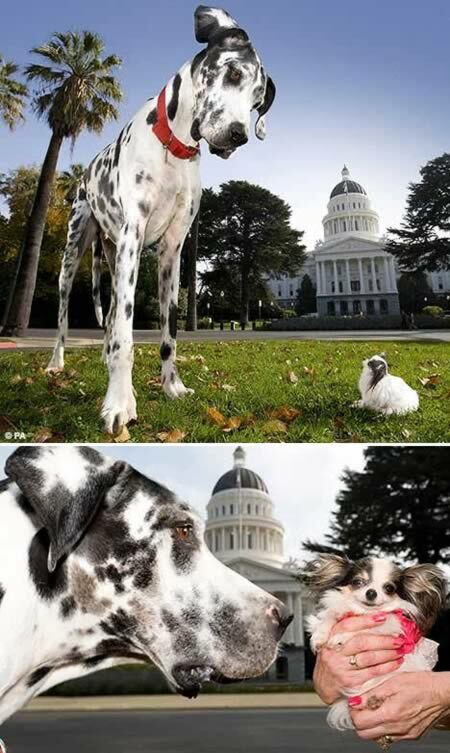 Standing worlds apart, 2 Guinness World Record holders come together as Gibson, a harlequin Great Dane who was the world's tallest dog in 2007, measuring an incredible 42.2 inches (107 centimeters), meets Boo, a long haired Chihuahua - who stands merely 4 inches (10.16 centimeters) high - smaller than Gibson's head. Both bred in America, the 2 celebrity canines united to celebrate Guinness World Records Day 2007. Eve, a US model measuring 6 ft 9 in (about 205cm) is the cover of Australian men's magazine Zoo Weekly. This beauty appears on the cover of the magazine's recent issue alongside a 162cm-tall Australian model. "No other magazine has put a woman who's nearly 7ft tall on the cover," editor Paul Merrill said. "We had her bikini specially made, but it was worth it." She may be standing in the shadows but one little horse is reaching heights of her own. 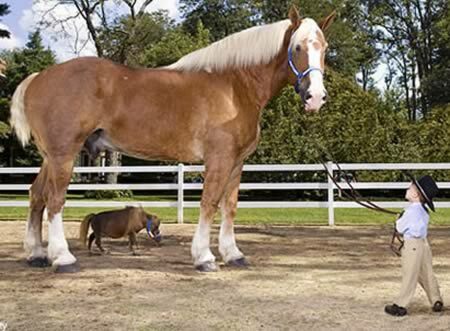 At a mere 17 inches, the miniature brown mare known as Thumbelina takes pride in the lofty title of the World's Smallest Living Horse. Her companion, Radar, is a Belgian draught horse with his own big claim to fame - as the World's Tallest Living Horse. Chandra Bahadur Dangi and Jyoti Amge were born 54 years and hundreds of miles apart in different countries, but it was their height that brought them together. Dangi, the world's shortest male, and Amge, the world's shortest female, met for the first time in 2012 with a little help from Guinness World Records. Amge, who lives in Nagpur, India, was named the shortest living woman at 24.7 inches on Dec. 16, 2011, just after turning 18. 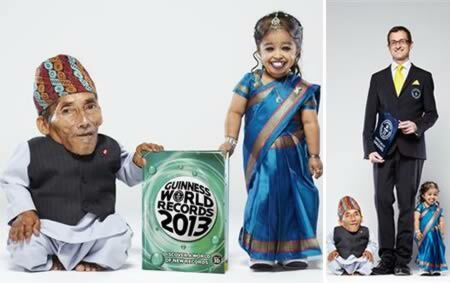 Dangi, 72, stands at 21.5 inches tall and was crowned the shortest man in Guinness' 57-year history in February. Prior to the announcement, the record-holder had never ventured far from his remote village of Rhimkholi, Nepal. Standing at just 2ft 5in high, He Pingping, from China, was officially named the smallest man in the world in 2008. Svetlana Pankratova, meanwhile, owns the longest legs in the world, which stretch to 132cm. Mr. Pingping barely came up to Ms. Pankratova's knees at a bizarre photoshoot held to mark the launch of the 2008 Guinness Book of World Records. But the pair seemed rather happy in each other's company as they posed for photos on Trafalgar Square's steps in central London. 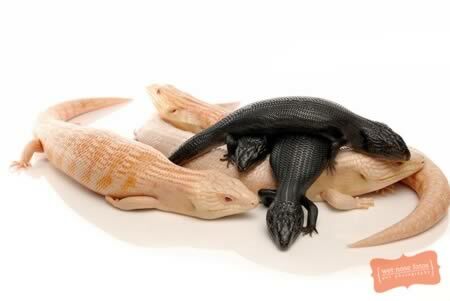 Albino & Melanistic Eastern Blue Tongue Skinks (Tiliqua scincoides scincoides), two very rare animals in one shot. Photo by Shannon Plummer, 2010. 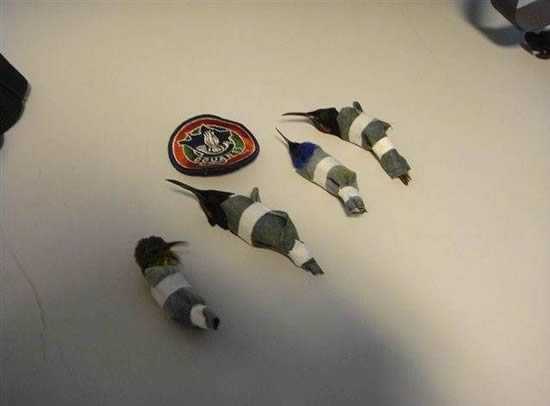 Traveler Tries to Smuggle Hummingbirds in His Trousers - Arrested! If you were sat next to this airline passenger, you might understand why he was fidgeting around so much. This Dutch traveler was caught trying to smuggle more than a dozen live hummingbirds in special pouches sewn into the inside of his underwear at Rochambeau airport in Cayenne, French Guiana. The birds were individually wrapped in cloth and taped up to prevent them from 'escaping' from their sweaty travel container. But fortunately for the unfortunate birds authorities noticed the passenger acting suspiciously and he was detained by French customs officers. 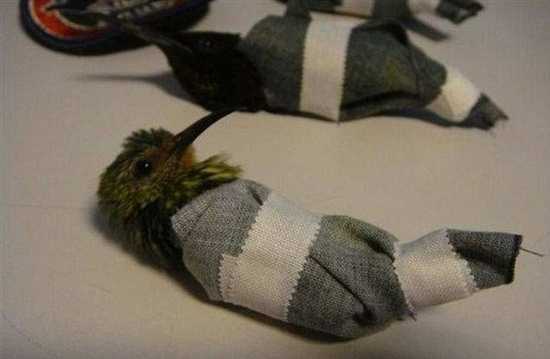 When his underwear was removed, officials discovered the haul of hummingbirds - who are not believed to have been sedated - lining the front. The man, who reportedly has a previous conviction for trying to smuggle the tiny creatures, was arrested. It is not clear if he has yet been charged.